While you will be required to perform a couple of extra steps to get Facebook, et-al functionality into your projects, you do not need to worry about changing your code. 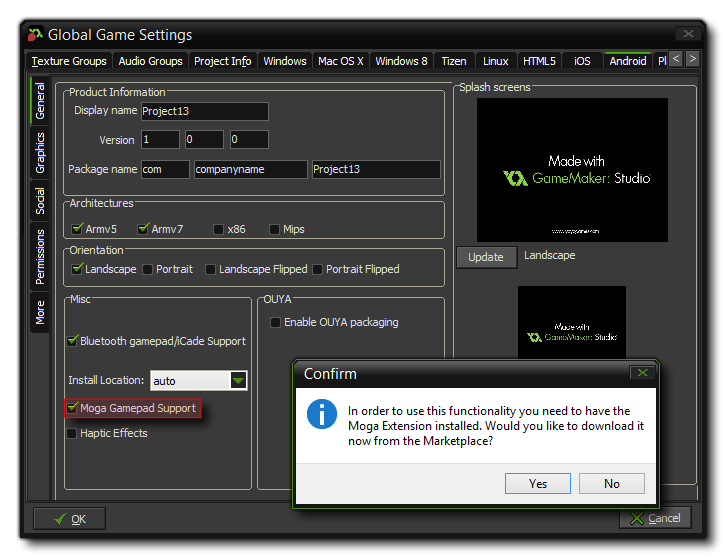 The extensions do not have any functions associated with them, and they simply hook into the existing GameMaker function calls. So, if you have a call to facebook_status() in your game, it will still work as long as you have added the extension to the project. The same is true for the Google Play/Amazon achievements and high scores, as well as for gamepad support via Moga - all the built in functions will "just work" as long as the extension is installed correctly and the appropriate target platform set. Ads and analytics have also been updated to this new system to provide you with a better workflow when using them. This means that you can now activate ads and analytics on the supported platforms (currently iOS and Android) as before, ie: from the Global Game Settings. Doing this will (like for the other above mentioned API's) open the Marketplace window and create a Marketplace filter showing you the required extension. You can then download this and install it in your project. It is worth noting that it is only the extension itself which is downloaded, with no extra files or demos of how to use it. 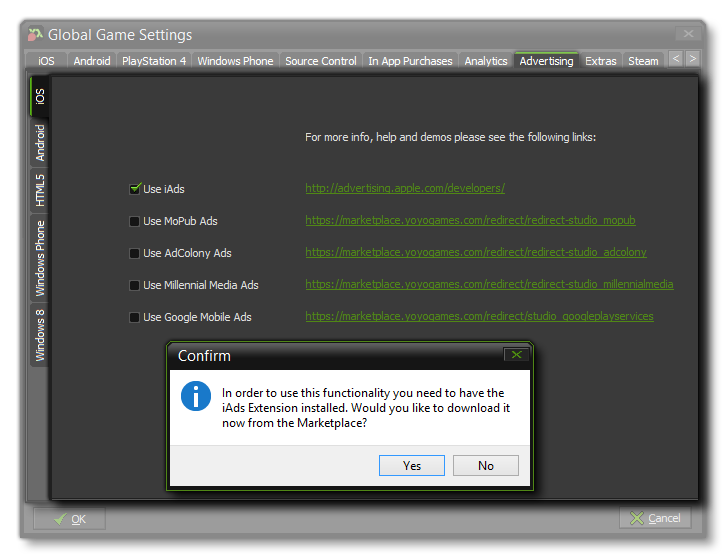 To get a demo - which contains example code as well as setup instructions - you can click the link next to the advertiser in the Global Game Settings and it will take you to the specific Marketplace listing where you can download them. It is recommended that you do this first if you have never used ads to get an idea of how they work, and the rest of this article will explain a bit more about these demos.